Hayden introduces a range of products that combine design, power and strength! Each Hayden central vacuum systems is a guaranteed quality and durability! A central vacuum is more powerful than a traditional canister vacuum and make the cleaning of a house much quicker with only a single hose, no unit to drag behind. 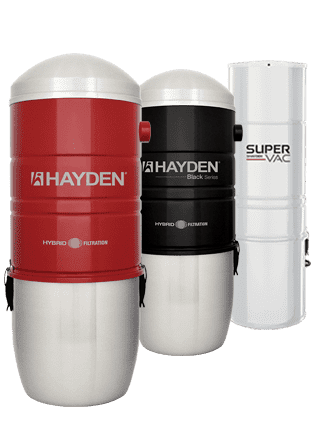 Since it’s customary to install a Hayden central vacuum in a remote location, its use is very quiet and eliminates dust and allergens out of the everyday living spaces. With a pipe system hidden inside the walls, the central vacuum remove the dust and traps it in its filtering system, providing a better air quality. The addition of a central vacuum system in a house is a long-term investment and ensure an added value to the building. Many of the Hayden signature products provide the necessary power to be used with a retractable hose system hidden inside the walls. Hayden is a renowned brand in the central vacuum industry for more than three decades. Hayden products have recognition with many central vacuum specialists in several regions of North America. Always associated with industry experts, the brand is a guarantee of quality and performance to their customers. In 2017, Hayden become the property of the manufacturer Trovac, who’s making history by displaying a new line of completely reinvented products under the commercial name Hayden. By focusing on the quality of the product behind Hayden’s success, the manufacturer presents new powerful and quiet central vacuums, with a modern design. These new top range central vacuum systems represent an added value to any home or real estate projects.